How simple, emotional driven stories have replaced considered political discussion. It seems that many people now get ALL their news from social media sources such as Facebook. facebook-twitter-really-people-get-news The following then is rather disturbing. Shortly after the 2016 US Presidential election it became clear that websites hosted in Macedonia had received huge amounts of traffic from Facebook. Supporters of Donald Trump had followed Facebook links to fake stories. FT, Fake News The authors of these sites used multiple identities to ‘share' numerous links to their sites. The people creating these sites, usually using material copied from elsewhere but with more outrageous headlines attached, took no ideological sides in the political debate. They, like numerous newspaper proprietors before them, were just maximising revenue. Google AdSense counts the clicks these sites receive and the operators make an income which is good by Macedonian standards. The popularity of these 'Fakebook' sites has created considerable alarm in Germany where there are fears that the 2017 German elections will be influenced by something similar.Facebook fact checking. In the same way that genes mutate to enhance the survival characteristics of their physical hosts an effective meme will enable its 'hosting' ideology to develop and reproduce. Memes that replicate most effectively enjoy more success, and they enable the reproduction of their 'hosting ideology’. In Dawkins' telling the world's religions are the 'hosting ideologies' of memes. But there can be many more. History is related in terms of such stories. A common narrative for the Second World War describes a battle between good and evil. Everything the Germans did was evil and everything the Allies did was proper and in support of the final justified victory. The Holocaust was an act of evil consistent with this narrative. But the indiscriminate bombing of the civilian population, by the Allies is not. Therefore, it tends to be dismissed, at least in most English language tellings of the story. The desire to see events in terms of simple narratives is exploited by the politically ambitious. The British EU referendum was portrayed as a struggle between a bunch of plucky, everyman campaigners and an elite who had surrendered Britain’s democratic process to the self serving bureaucrats of Brussels. The slogan, ‘Take Back Control’ became a meme within this narrative. The story portrays the people who supported Brexit as David struggling to defeat the Goliath of Brussels bureaucracy. Another meme spoke of the evils of multiculturalism. In the Brexit telling multiculturalism was part of the EU conspiracy. A folly contrived by the left leaning elite who imagined that all races are capable of living together. It ignored the fact that the multicultural history of Britain is actually founded on imperialism. Immigrants from the former British Empire colonies had been invited to Britain as a cheap labour force since well before the European Union was conceived. A similar meme has been coopted by Trump for his campaign. It ignores the fact that the forefathers of the black population were forcibly transported there. 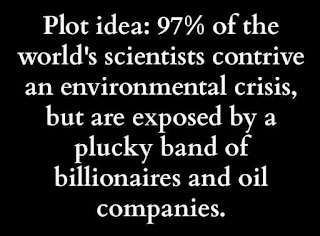 Climate Change has been incorporated into another good guys versus bad guys story. Donald Trump has promoted the tale that Climate Change is a myth masterminded by the Chinese in order to make US industry uncompetitive. 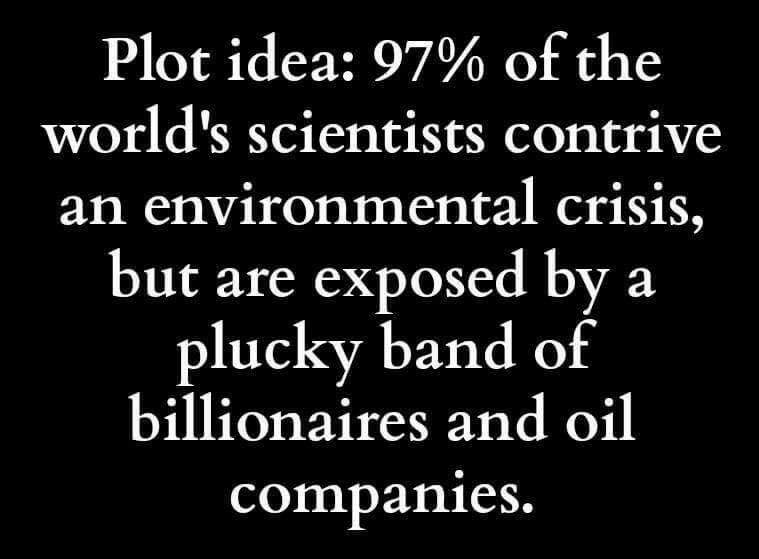 Others, such as the British journalist James Delingpole, have portrayed Climate Change as a conspiracy of the scientists themselves who are deceiving the public in order to serve their own sinister and miserable ends. Donald Trump spent the Presidential campaign looking for positive feedback. Picking up on a few contrarian positions he has done little beyond chasing public approval. His actual policies are hardly discussed. The Trump story is the plucky outsider taking on the establishment. The David and Goliath story. And so Trump managed to persuade people who normally don't vote to go out and vote for him. The creators of those Macedonian websites were simply adding material to an ongoing narrative, creating confirmation bias for those backing Trump. The Trump story is simple. It has no need or room for facts. Such stories allow people to engage with issues on an emotional level then all the difficult historical and technical details can be ignored. Every week a new chapter emerges, for example, Trump is offended by an Hollywood actor. Trump insults her right back. Then, the more the left is outraged the more courageous the Trump/David is being towards the Goliath of the establishment. Once the audience is engaged emotionally it really doesn’t matter how implausible the plot is. As long as you can keep the conflict going the audience will continue to follow and continue to cheer for the good guys. No matter how improbable good guys they may be. Here's an excellent article from Laurie Penny on the subject.